At Coburn’s Exclusive we specialize in custom-fabrication. With a team of experienced AutoCAD designers, we can inspire, design, fabricate, and install the perfect entrance to your space. Explore some of our custom doors and windows below. 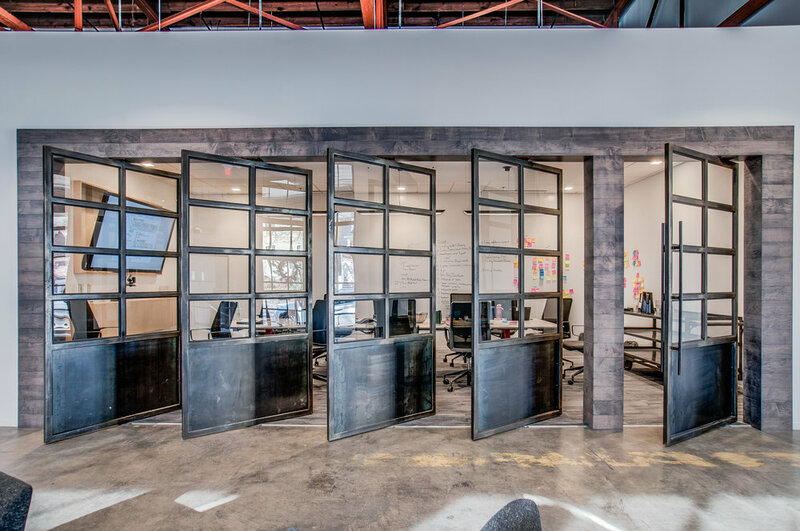 For Tuck Hinton Architects Studio, we utilized glass walls, doors, and dividers to maintain an open feel while still providing personal office space. These are accented with powder-coated brass panels and textured door pulls to bring warmth and interest to the office. 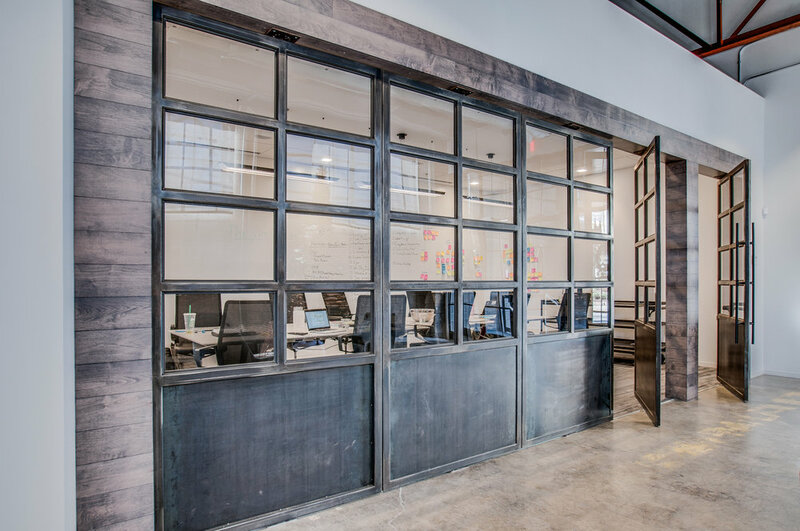 The patinated zinc, barn style doors around the space are a great industrial contrast to the sleek blackened steel glass frames and provide more privacy. The Institute for Supply Management needed a unique entrance to their conference room that was sound-proof for privacy, but could also be opened up to connect with the rest of the space when needed. The oil finished, raw steel we chose for this project fits the distressed framing and the requested rustic-industrial style perfectly. 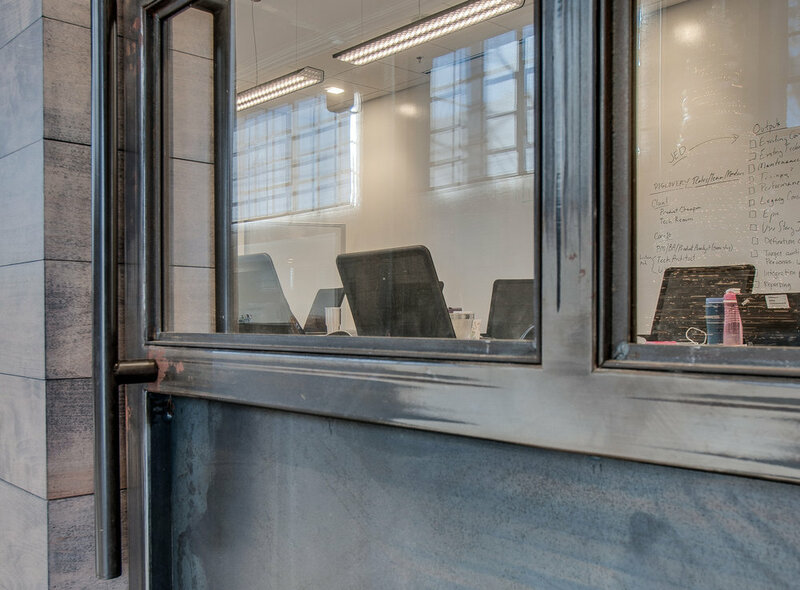 We fabricated these swiveling doors to open both ways, but overlapping on the inside to provide the soundproofing for important meetings and presentations. The doors are made to open and click in place up to 90º so they do not swing open and closed freely. 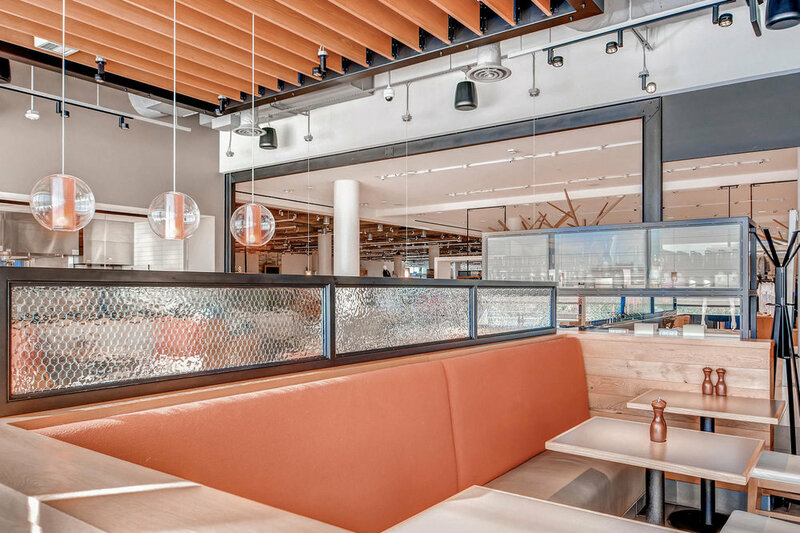 Milk and Honey, one of Nashville’s new restaurants in the Gulch, needed window frames that were modern and matched the vision they had for the space. 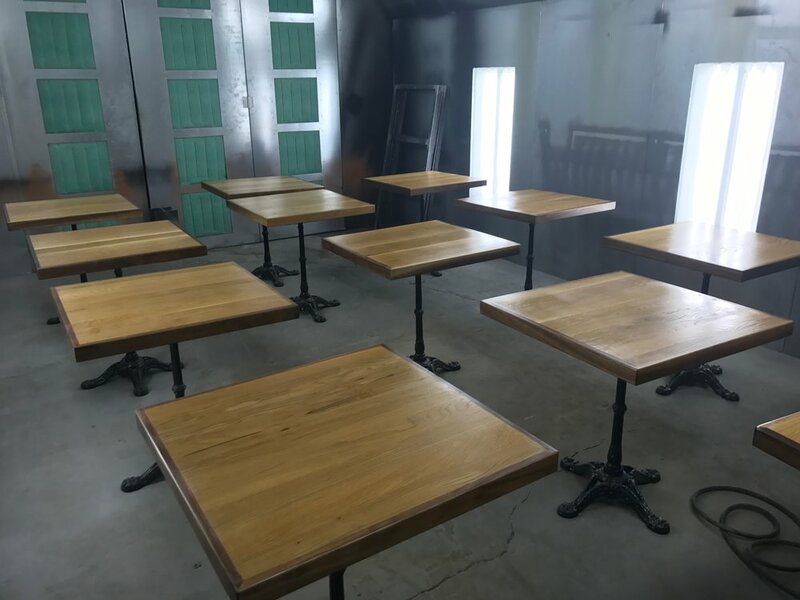 We went with a satin black powder coat over steel framing to match the black accents throughout the restaurant, and to allow the products to be the main focus. 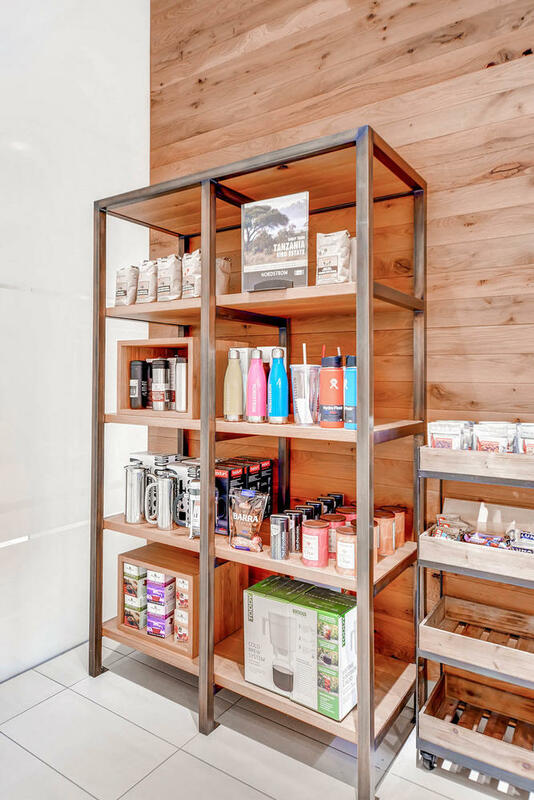 Along with the window frames, we also custom-fabricated matching product shelving, tables, and the entrance doors in the same satin black powder coat to bring the space together and create a uniform look throughout the room. Velocity in the Gulch is a new apartment building downtown. Their style is elegant, crisp, modern, and minimal. 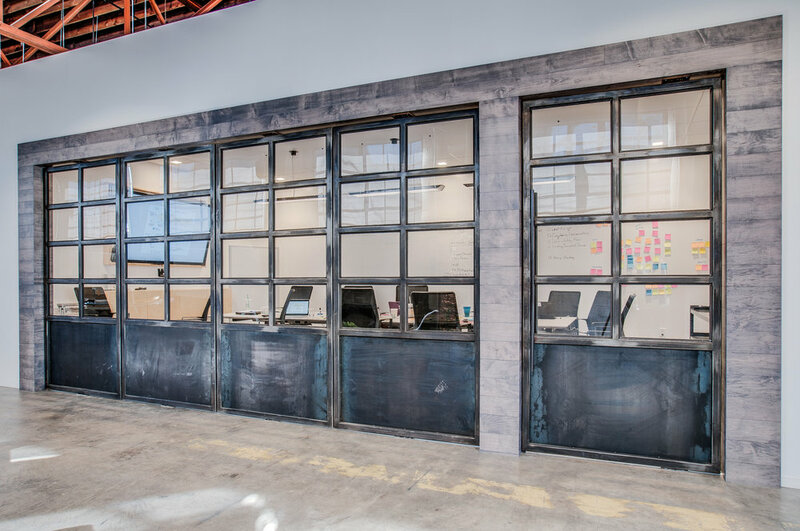 We think these custom, blackened steel barn doors are a great addition to their leasing office. Blackened steel is one of our favorite, and most popular, finishes here at Coburn’s Exclusive. 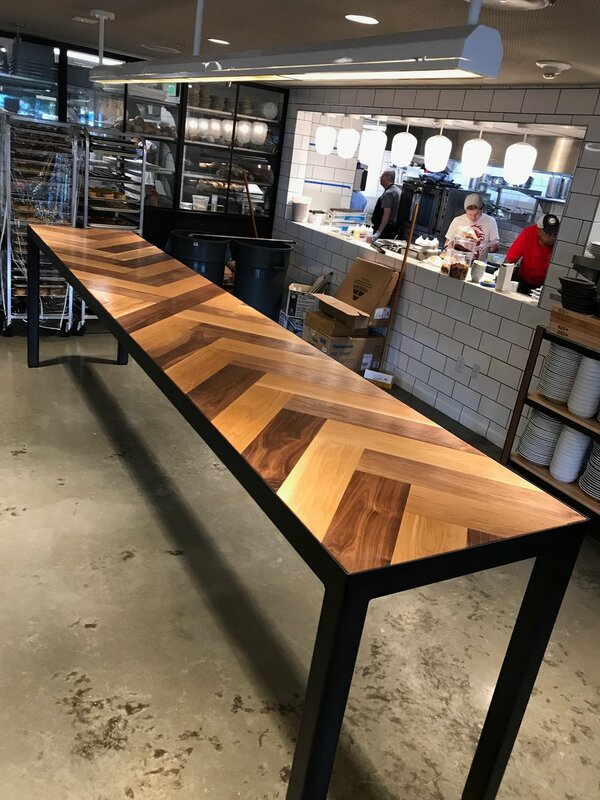 There is slight variation in the finish due to the process meaning each piece is unique, but still maintains a uniform look throughout the space. 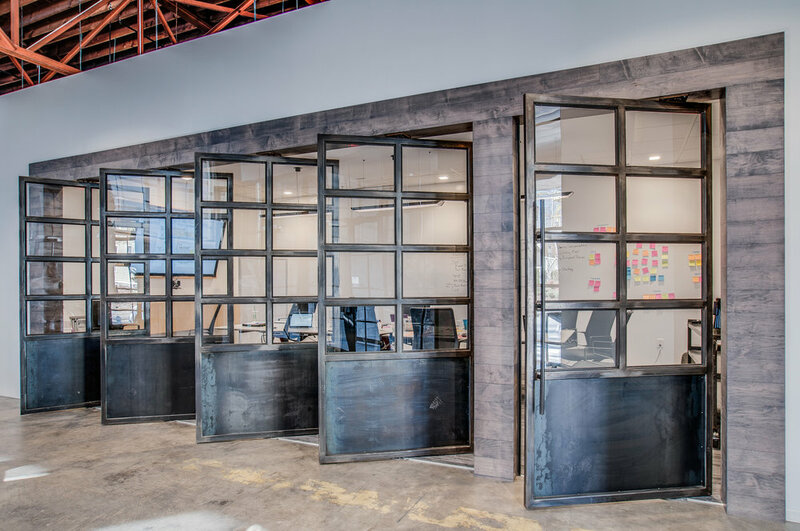 We custom-fabricated this blackened steel door frame with stainless pulls for the Microsoft offices at OneCity in Nashville. The blackened finish fits well with the reclaimed wood used for the door and the stainless hardware gives the project a clean, modern feel. 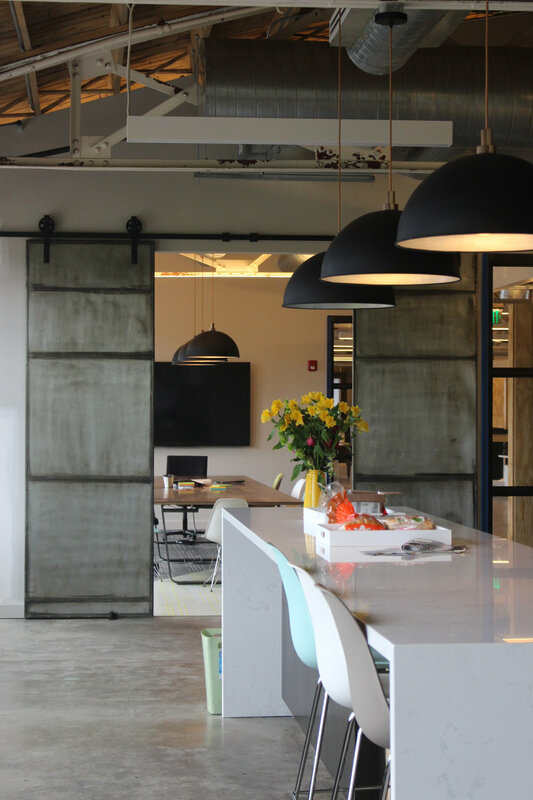 We also fabricated a blackened steel table, nesting table frames, and a steel cloud panel for the interior of the office, giving each area a cohesive look that brings the space together. Deacon’s New South, a restaurant located in the heart of downtown in the L&C Tower, has a unique art-deco theme. 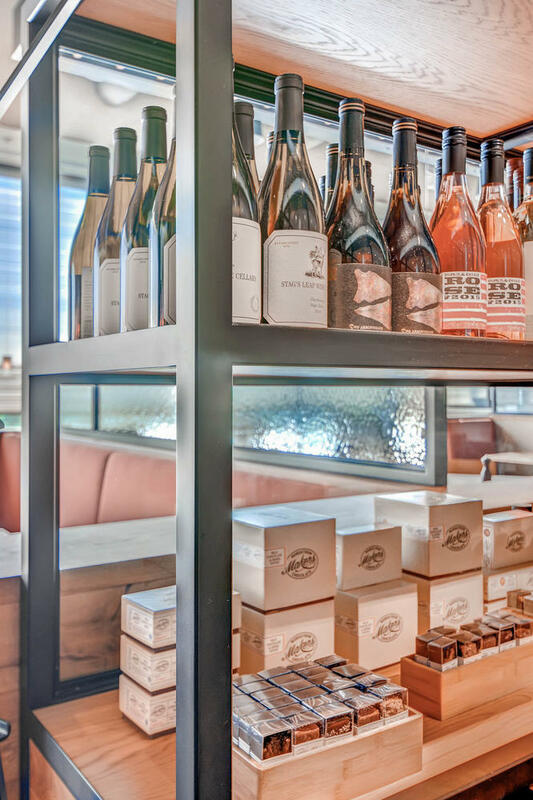 We custom fabricated brass railing and countertops, contrasted with black powder-coated window frames in the kitchen and dining area as well as a wine cellar door. The window frames are unique as they feature swiveling hinges that allow panes to be pulled out or in, giving the divider dimension and setting it apart from other, standard frames. The flat black finish contrasts the shiny brass throughout the space. 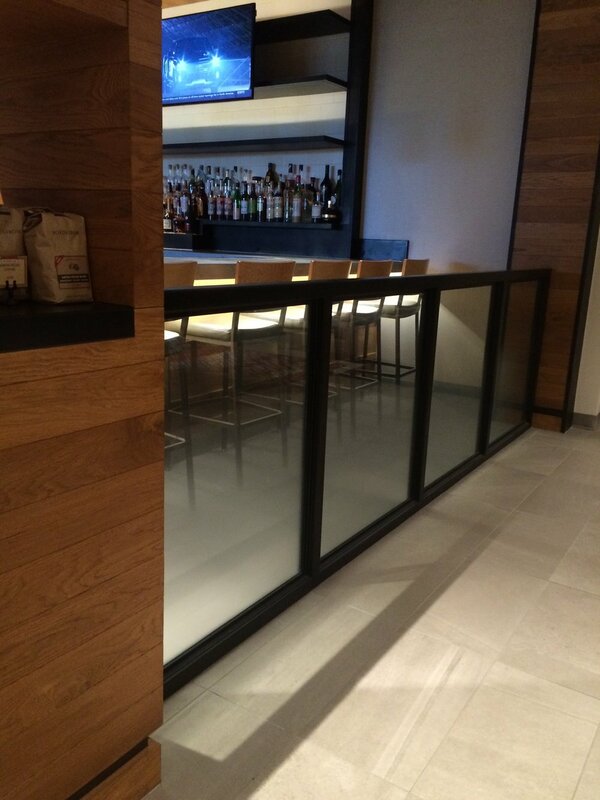 We love the look of the light colored wood next to our blackened steel at this cafe at the Nordstrom in Ridgedale, MN. 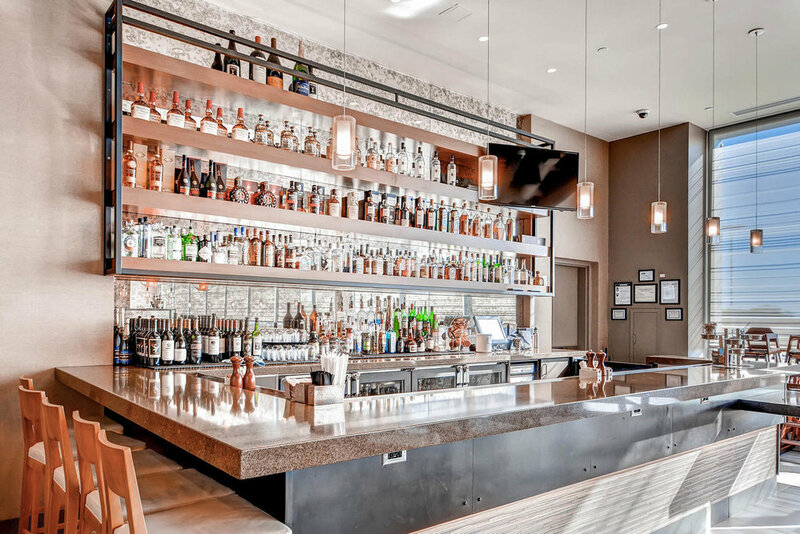 We fabricated the storefront framing, glass and steel booth dividers, hostess desk, queueing rail, product shelving, and the framing for the wood and steel cloud panel. You can see the color variation in our blackened steel finish in these pieces, and we think it makes the space. 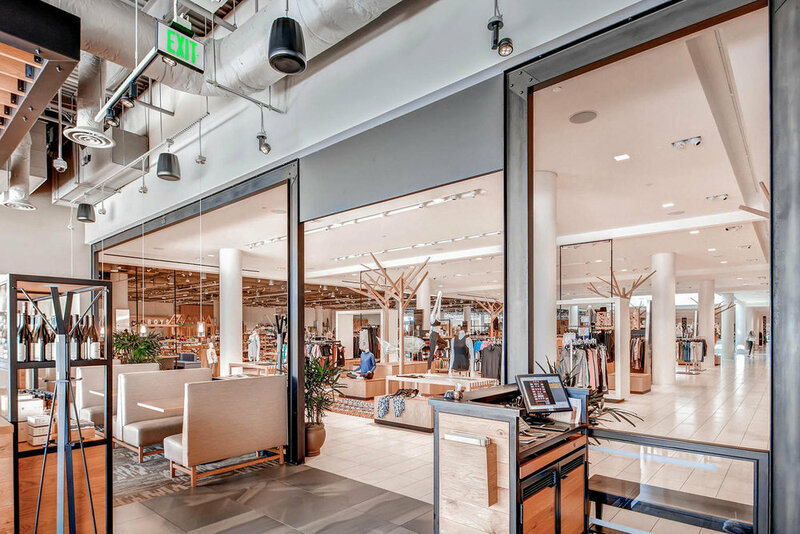 We fabricated this glass railing for the storefront of the Ruscello in Nordstrom at South Coast Plaza. The storefront is the first thing you see, make a lasting impression with our unique blackened steel and glass railing! 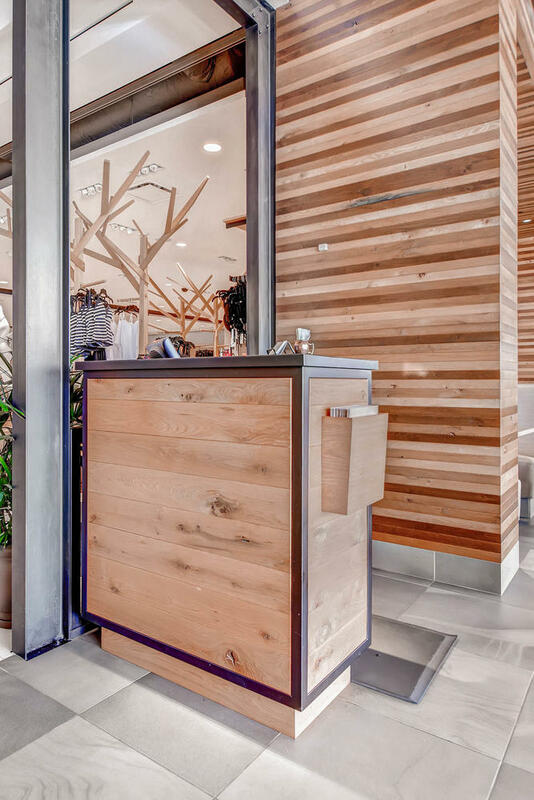 We also fabricated decorative paneling, shelving, and countertops to match so the space has a uniform look. 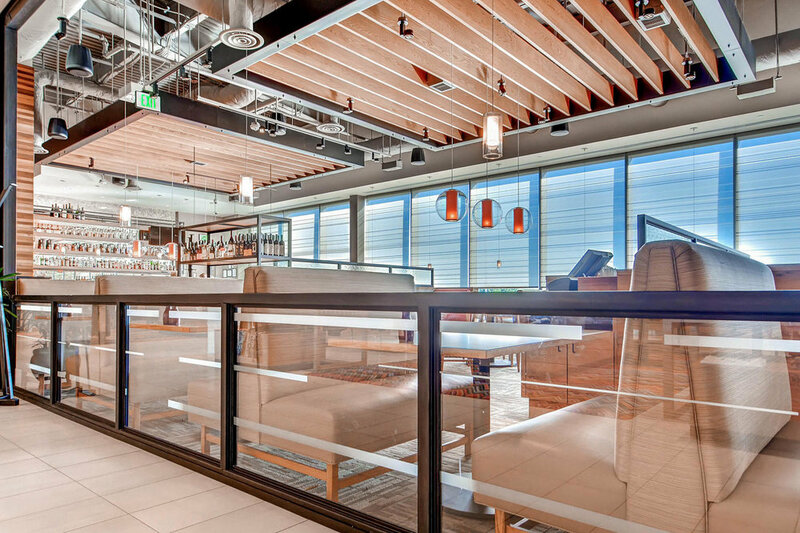 We are proud to have been a part of the VIP suite for Nissan Stadium in Nashville, TN. 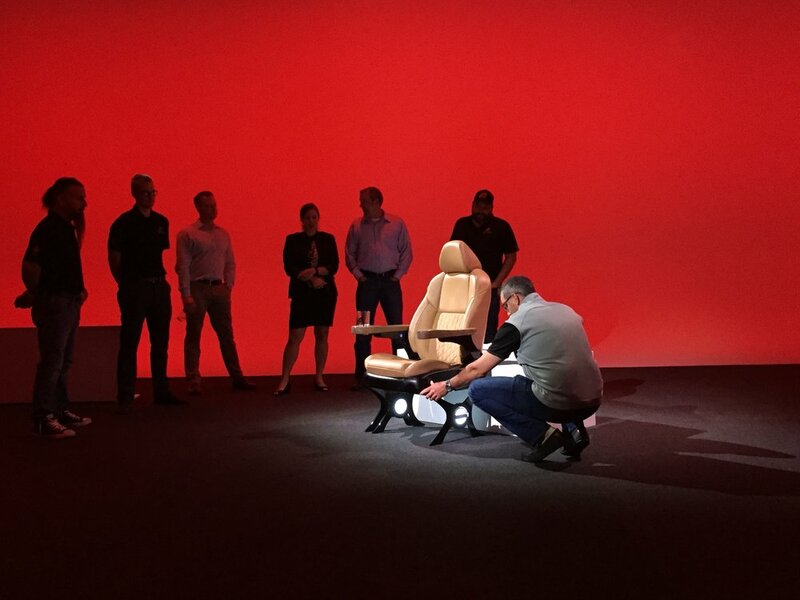 We fabricated a large, functional barn door complete with asymmetrical steel framing and decorative panels, along with new seating made from Nissan car seats. The framing of the door is powder coated in a matte black to leave the focus on the design of the door as well as the unique seating. We are proud to have been a part of bringing the vision for the penthouse of Nashville’s first and tallest residential skyscraper to life. The finish chosen for the custom doors, railing brackets, fireplace facade, and shelving was our blackened powder coat on steel. 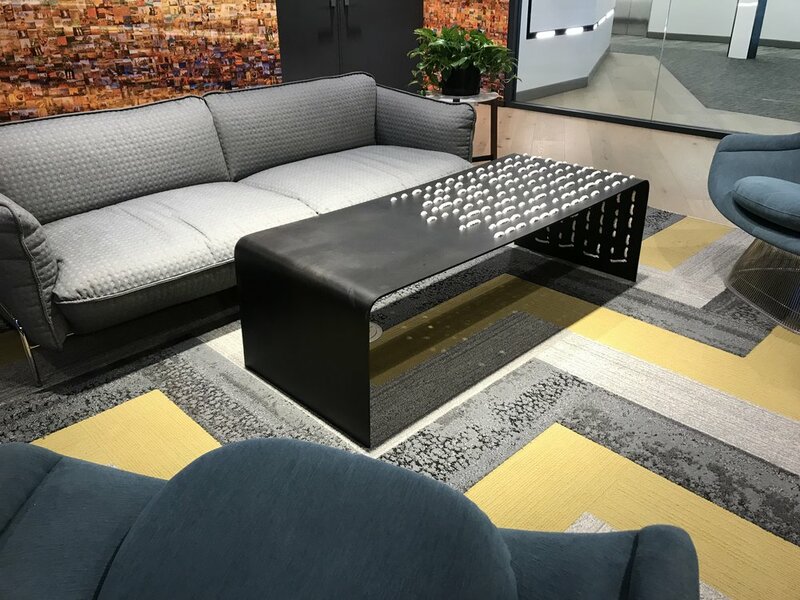 The unique finish offers slight variation which gives the pieces interest, but doesn’t overshadow the rest of the luxury decor in the space. We think the pieces are different enough to hold their own, yet uniform enough to make each room feel uniform and cohesive. 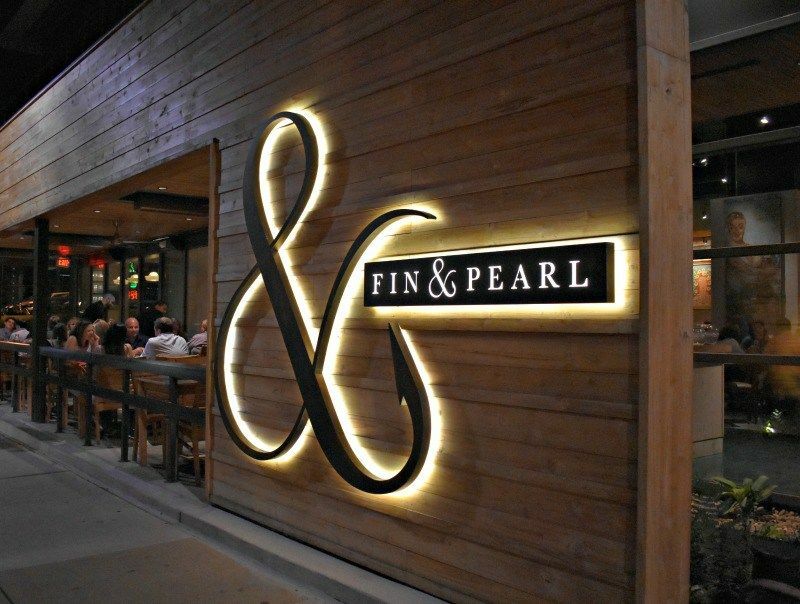 We fabricated decorative panels for the bar at Fin and Pearl as well as blackened steel window frames for the dining room. The custom windows we created provide privacy without closing off the space completely. The blackened finish fits the feel of the space perfectly and holds its own without taking the attention away from the decor in the rest of the room. 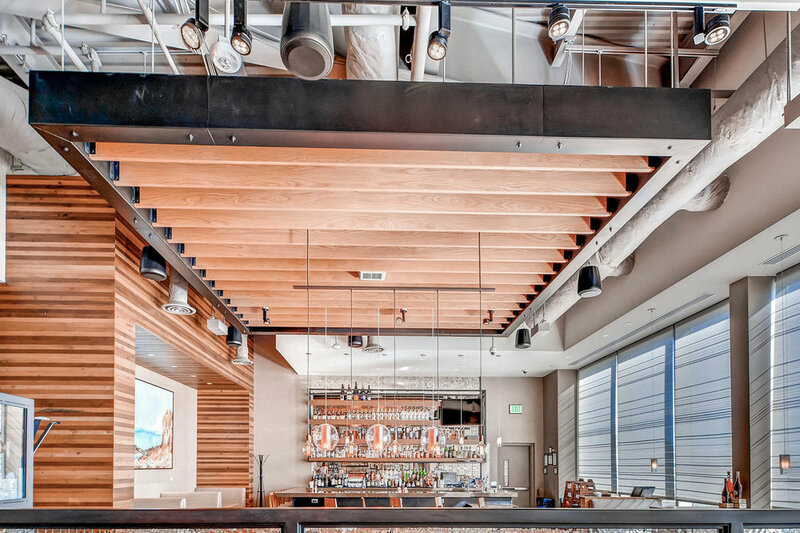 The main focus in Fin and Pearl is the perforated panels we fabricated and installed in the bar area. While being interesting and a great statement piece, we made sure they would not overpower the rest of the space.